There is an increasing amount of halal restaurants that are opening up all around Melbourne, in fact all around the country! When we first came to Australia many years ago, halal restaurants were quite scarce – and to see them growing at an exponential rate is fantastic! And what I love is that it is not only restricted to the cuisines that you would normally associate with “halal” food such as middle eastern cuisine – but the cuisines itself have quite a variety as well – from Italian to Steakhouses! When Bill Bilwani from Fiesta Mexican contacted me about coming to try out his restaurant and that the meat was entirely Halal I was wrapped! I am a huge fan of Mexican food and usually have to always stick to the seafood and vegetarian versions of the enchiladas, tacos etc – but with this restaurant being Halal I could experience what every other person gets to – the meat enchiladas, tacos etc! I headed down with my parents to experience this wonderful Mexican place for myself. Fiesta Mexican has been around for just over 30 years and is located in Toorak Road in South Yarra. It is a family run business owned by Bill Bilwani with his son Shaheen helping out. The venue has had a makeover in the recent months and the result is a vibrant, colourful, mini-Mexico in Melbourne theme complete with psychedelic artwork which includes a hawk to the right when you enter as well as a woman with an eagle as her hair near the bar and counter area. There is mood lighting thanks to the Mexican Steer Bull shaped light shades – these look really cool lined up on the wall and further adding to the Mexican feel. There are wooden tables – each which have engraving on the table top – ours had a dancing Mexican lady – that can seat from 2 right up to 8 people depending on how large your group size is. We were seated at the front of the restaurant by the window – which allowed us to take in the whole length of the restaurant. There are stairs at the back which lead to a function area upstairs that can be booked out for celebrations. An interesting fact to note is that they have had celebrities like Lleyton Hewitt, Andre Agassi and even the Williams sisters come to dine here and there are some menu items named after them – the Agassi or Hewitt Burrito. We were given our menus and I was overwhelmed by the choice and varieties before me – there were pages and pages of food to choose from and from reading the description of each I almost wanted a little taste of everything. There is an extensive range of tacos, burritos, fajitas, quesadillas, enchiladas as well as a good selection of desserts. There is also a separate Gluten Free menu, and they also cater for vegetarians, coeliac guests and vegans too. The Dine in Menu is split into different sections – Apertivos, Soft Tacos , Entremese (Entrees), Ensaladas (Salads), Comidas (Main Courses) as well as Paellas. The Paellas however need to be ordered 2 days in advance and there are two different options – Chicken or Seafood. There is also a banquette menu – one for $35 and one $45 – the latter has a more seafood feel to it and includes 2 desserts, whereas the other has only one dessert and more of a beef and chicken feel to it. There is also a section that lists out the Vegetarian Main courses. Fiesta Mexican also has a takeaway menu and provides a delivery service as well – further extending out their clientele. Whilst trying to decide what to order I ordered a drink from the list of Mocktails they had to offer – Mango Margarita. This came out in a larger than normal cocktail glass with a green stem – which contrasted really well with the yellow drink – there was salt around the rim of the glass in true margarita style. The drink was refreshingly sour and I quite enjoyed it. We decided to order the Wingettes – fiery red hot marinaded chicken wingettes with chipotle and adobe mix, as well as the Carne Enchilada de Cheddar – Oven baked 6” corn tortilla rolled with slow cooked shredded topside beef, Monterey Jack cheese, white onion and mild smoked cayenne sauce to share. The chicken wingettes were delicious and tasted – they had a smoky, spicy yet sweet taste to them with the chicken cooked perfectly. The chipotle added a refreshing hit to those who would find the wingettes spicy. The Carne Enchilada was soft and really easy to cut into – almost like butter. The beef inside was just as soft and tender – and flavoured deliciously. The combination of the beef, onion and smoky sauce on top was like a flavour hit in your mouth. A great way to start the meal. Each of these dishes came with a side salad consisting of salad leaves, red onions, cucumber and tomato. For mains we ordered three dishes to share. The first dish was the Fiesta Autentica – the house specialty, a combination of beef, chicken, potatoes, tomatoes, serrano chilli & fresh cilantro, delicious with flour tortillas, arroz verde & leaf salad. This was my favourite dish out of the three mains. The combination of both the beef, chicken and potatoes was fantastic and it had a great addition of spice. It actually reminded me of a dish that my mum used to make when I was younger so the memories it brought back were special too! The flour tortillas added the perfect addition to envelope this spicy tender mix and savor the flavours. Both the chicken and beef were tender and soft. If you love spicy dishes this is definitely one to try out. The second of the mains we had was the Pollo Cajun – chicken breast coated in a blend of paprika, red pepper & garlic, served with, arroz verde & mango salsa. The coating on the chicken was delicious and really worked well with the texture of the chicken. The chicken wasn’t as tender as in the other dishes, however was still brilliant. The mango salsa was amazing as well – the spiciness mixed in with the sweetness of the mango worked well together. The rice – arroz verde -that came with these dishes were also really tasty – the rice grains were easily separated and was cooked pilaf style – my fave style of rice. The last of the mains we ordered was the Carne En Tiras – two beef enchiladas with mild cayenne chilli sauce, served with brown rice & pico de gallo. This was similar to the entree that we had and was just as delicious – soft, spicy with a touch of smokines. The addition of the brown rice and pico de gallo was a great addition, and together with the enchiladas was tasty mouthful. For dessert there was an interesting combination on the menu titled ‘Sensation is Mother of Invention’ – which had jalapeno, Rose Petal with Crunchy Candy Ice Cream – served with White chocolate and raisin sauce – however I wasn’t brave enough to see what that was about. We decided to order the ‘Crazy for Chocolate’ – chocolate mousse, chocolate dipped strawberries, chocolate heart and vanilla ice cream with chocolate flakes. This dish was plated out differently to most other desserts I have come across. The chocolate mousse was in a square glass cup, the vanilla ice cream was in a black espresso cup topped with a strawberry, the chocolate dipped strawberries were placed around with the chocolate heart in the centre of the plate – which served as the “tray” for the dessert. I really liked the presentation and thought it was unique. The chocolate mousse was to die for – creamy, smooth and full of chocolatey goodness. The dipped strawberries had dark chocolate used and the bitterness of the chocolate worked well against the sweetness of the strawberry. The staff are really friendly and lively which really does add to the complete the atmosphere of the place. From the moment you step in, you are greeted with a happy hello and shown to your table. They seem to really enjoy what they do. We also got to chat to Shaheen for a bit and learnt more about of his passion and drive for being in the food industry despite completing a law degree. He is very engaging and full of smiles, and goes from table to table ensuring all the guests are looked after. Great customer service! Despite being a Wednesday night – the place got really full – with the crowd ranging from couples to larger groups out for dinner. There were other really interesting dishes around the room that other diners had ordered – such as the sizzling hot plates, and a drink that was flamed. The food was great and stayed true to the authentic Mexican flavours, the atmosphere was fun and lively and the staff friendly. There really is nothing more you can ask for when you go to dine out. The fact that the meat was all halal was a massive bonus for me. If you love Mexican food and want a huge variety to choose from, either way Fiesta Mexican is definitely a place for you! A and I were looking for a place where we could have some dessert after dinner and I stumbled across The Smith and its renowned dessert – The Knickerbocker. It was a Friday night and I knew that they would be busy so I called up to see if they would have space for the two of us to have dessert – they were very helpful and said to come and they would find a space for us. How nice of them! So we headed down and literally had the best seats in the house – at the bar counter overlooking the kitchen –we could actually watch as our desserts were being made. The Smith is located in High Street, Prahran – one of the trendier suburbs in Melbourne and the venue matches. The owner is Scott Borg (former director of Taxi and Circa), and he has created this swanky, sophisticated and fun venue that offers all day dining. From the outside it looks like a pub, but once you are inside you are welcomed by a fun and casual vibe. To the right is the bar and courtyard and to the right is the main dining area, which travels all along to the back room which is another dining area. Here is where the fantastic open kitchen resides, with the opportunity to sit at the bar overlooking the kitchen – best view in the house! The back dining room has high ceilings together with a combination of round, square and communal wooden tables. The fit out is classy, elegant all whilst staying casual and welcoming. We were just there for desserts so we were given the dessert menu to peruse. Whilst tossing up what we wanted to have for dessert – we could see the other meals being prepared in the kitchen and being sent out to the diners. They looked amazingly delicious! It made us wish that we had come here for dinner as well! 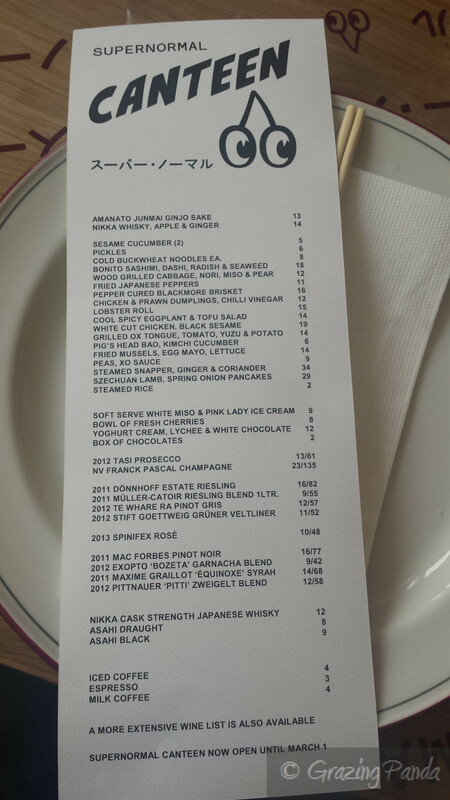 The menu is prepared by Michael Lambie (also ex Taxi and Circa). The Smith offers six-course and eight-course tasting menus at $70 and $85. The menu is split into six sections – starting off with “Oysters” (there are three to choose from), moving onto “Mouthful”, then “Tastes”, followed by “Fish & Meat”, then “Sides” and ending on dessert dubbed “To End.” Mouthful includes morsels of food that ranges from pork croquettes, to tempura king prawns, soft shell crab, tofu and salmon tartare. There are a number of “Tastes” and “Fish & Meat” dishes to select from as well – the variety ensures that there really is a dish for everyone and every dietary requirement. 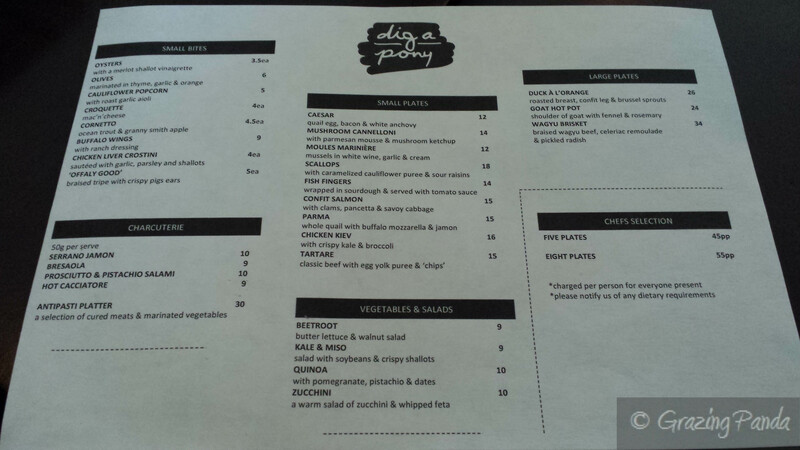 The menu is a combination of many cuisines – from Mexican to Thai to Japanese and even Modern Australian Country. There were four different desserts to choose from which included The Smith Carrot Cake with citrus cream cheese, Chocolate dulce de elce with blood orange foam and the two desserts we chose to have. What is great about the desserts here are not only do they sound good, but most of them are Gluten-Free, Nut-Free etc. 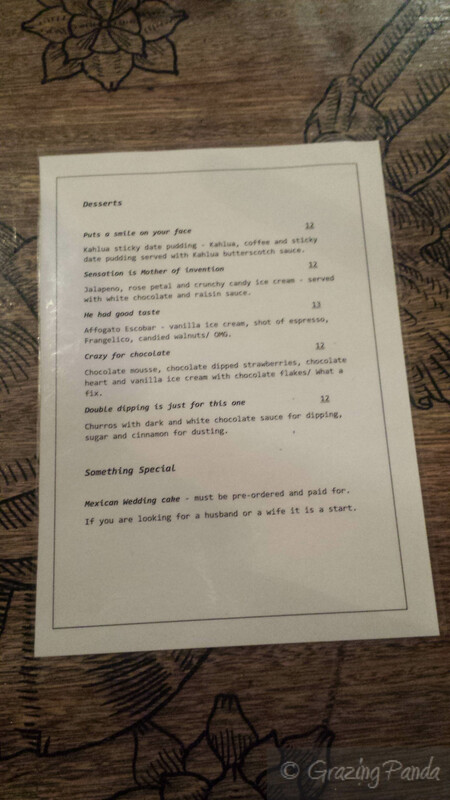 The menu marks down what each dessert is, as well as suggesting what drink it would go well with. There is also a cheese selection if you are a cheese fan. I ordered the The Smith Knickerbocker Glory (GF, EF, NF) – which was essentially like a trifle – it had layers and layers of sweet goodness. There are layers of macerated sweet tart fruit including pomegranate molasses, berries, strawberries topped with whipped cream, chocolate buttons, jelly squares and chunky bits of honeycomb. There were so many textures and flavours going on and it really was a fun dessert to have. I loved the combination of cream and berries any day so this dessert worked really well for me and was just what I craved and wanted. A ordered the Raspberry Souffle with White Chocolate Ice Cream (GF) which was mighty impressive when it was placed in front of us. The overflow of the soufflé looked delightful and was topped with icing sugar; to the side was the white chocolate ice cream. The soufflé was literally melt in your mouth and the tanginess worked extremely well in contrast to the sweetness of the white chocolate ice cream. A winner! Whilst we were eating our desserts we watched as The Smith Carrot cake was being made and boy did it look impressive! There were so many elements that were added – as you watch you think that it would be the last ingredient placed – but wait there’s more – more and more elements added – and the end result: spectacular. The dish was finished with petals, flowers and reminded me of a swan. Definitely wanting to try this out next time! We also ordered tea to go with our dessert – and I tried the Russian Caravan tea for the first time! I have previously not heard of this flavour and was intrigued to try it out. This tea is a blended oolong, keemun and lapsang souchong tea and has a vibrant and strong aroma to match a nutty, malty and smoky flavouring. I might actually consider purchasing some of my own Russian Caravan tea! The staff were really helpful and our waiter especially was really friendly! Customer service was really good and the staff looked like they were having a good time. The Smith is great place be it for a casual catch up dinner or a celebration. The atmosphere is lively, fun and very friendly. The Smith also has two function rooms upstairs, with a separate bar and kitchen. One of the rooms is called “Mr Smith” which is the more masculine version complete with leather seats and can seat up to 40 people. The other room is aptly named “Mrs Smith” – complete with white walls and can seat up to 24 people. There is a wall between the two that can be opened up to create one larger space if needed. The Smith serves a large variety of food in a venue that is stylish, elegant yet casual and relaxed – the staff are friendly and helpful and the food dishes not only look spectacular but taste great too! What more could you ask for really? Atmosphere / Ambience: Elegant, Stylish, Casual and Fun. There is an area for dining and an area for drinks, as well as a courtyard. There are also function rooms. Service: Fantastic – very friendly and helpful! E was swapping Australia for Canada so four us decided to celebrate by checking out Om Nom Dessert Bar before she left. Om Nom is located at the Adelphi Hotel (that also houses Ezard in its lower level) at Flinders Lane. For Om Nom you need to go up the stairs and head towards the back area of the main foyer / lift lobby area. From the moment you step in you are greeted by the modern, elegant, French themed fit out. From the life size mesh sculpture of a horse to the seating that is in shapes of hard lollies. As you make your way towards the main seating – there are little areas of seating complete with a black plush sofa swing and colourful cushions – and some cushions in the shape of a bowtie lolly. Abstract art in the shape of a face further adds colour to this mostly black and white colour scheme. Om Nom seats 40 and you will definitely need to book in advance to secure your spot. There are two chefs behind Om Nom. They are head chef Christy Tania who arrived from France two years ago to work at Sake and has also worked at Vue de Monde and Jacques Reymond. How’s that for experience! As well as Pierrick Boyer who is currently behind the spectacular creations at Le Petit Gateau. Tania used to previously work at IBM in Singapore and quit her job there, folded her business (she had a side business of baking wedding and birthday cakes) to fly to France to get trained in the world of pastry and more. She has worked under world renowed chefs such as Alain Ducasse, Michel Roth and Sebastien Serveau. Currently she has also launched an online cake business – C’est Bon. I had already looked at the menu before coming here and had made sure that I didn’t have anything sweet all day as I knew I wanted to do the Dessert Degustation. The Dessert Degustation is $55 and allows you to try 3 different desserts. The desserts are mini version of the actual desserts – but it was nevertheless still great to sample and try. I think this is a great idea as it allows you to hone in what dessert you like the best and come back and have the full size version next time! The first dessert that came out as part of the degustation was the Raspberry Field – raspberry, lychee, meringue, rosewater. I had already seen pictures and heard a lot about this dessert so I was really looking forward to seeing it in real life and seeing how the flavour combination worked. The presentation was fantastic and really adorable – so much so that you don’t really want to touch it or break anything to eat it. I think I took about 50 photos, in all sorts of angles of this dish. As my Raspberry Field was part of the degustation I only got one smaller toadstool, whereas the main dessert dish had two larger toadstools. As E was leaving and they knew this – they had sweetly written ‘Bon Voyage’ on her dessert – nice touch! The main toadstool is made of a crunchy meringue base that acts as the stalk of the toadstool, and topped with a tangy and smooth raspberry sorbet that has white chocolate pieces dotted on it. Surrounding this toadstool is the “forest floor” of fresh lychees, rosewater bursts, fresh raspberries and finished with white chocolate sand. I really did love each element. Anything with lychees for me is heaven – in fact whenever I order a mocktail and they ask me what flavours I want, my first go to is always lychee. The sorbet was perfectly tangy and complemented the sweetness of the meringue. I loved the rosewater burst – added more texture and fun-ness to the dish! The next dessert to arrive was the Basil Garden – dark chocolate, vanilla, olive oil, honey, basil, lime, white chocolate & meringue. Once again the presentation of this dish was magnificent. It literally looked like a little potted plant complete with chocolate soil. The “pot” is made out of chocolate and filled inside with vanilla, olive oil and honey ice cream and topped with lime, basil and white chocolate. The finishing touches were some vibrant purple flowers and green leaves. The result was quite a light dish, with plenty of refreshing flavour combinations and the added texture of the chocolate soil. It definitely looks too pretty to eat but once you start you won’t be able to stop. The last dessert that I ordered was the Mango Alfonso – choux pastry, shiso, coconut, kalamanzi, lemongrass, ginger & caramelised white chocolate. This dessert consisted of mang0-cream filled profiteroles which has been topped with bright, glossy fondant icing as well as a chocolate disc. On top of this chocolate disc, there is a ball of shiso and mango. There was also kalamanzi (this is a citrus fruit –sometimes called the Phillipine lime) sorbet as well as coconut spheres that pop with fillings of coconut cream, as well as a coconut and lemongrass foam. As part of the degustation menu – you get one profiterole but the main sized dessert you get two profiteroles layered carefully on top of each other. The pastry is crunchy and together with the mango cream inside was delicious. Paired together with all the elements it made for a really interesting dish – the pairing of mango and coconut work really well together. There were some great textures and interesting flavours in this dish – especially the addition of lemongrass. S is a massive chocolate lover and therefore settled on getting the Chocolate Souffle – Guayaquil 64% Chocolate, Mandarin Marmalade, Kalaminsi Sorbet, Milk Foam. We sampled the soufflé and it was indeed brilliant – complete with a gooey centre. The Milk Foam pairing worked well and made it reminiscent of drinking cocoa before bed – which further added to the “close your eyes and savour the moment” feeling. C ordered the Banana Flambe – Rum, Cinnamon, Rosemary, Chocolate Sponge, Vanilla and Caramelized White Chocolate Ice Cream. This dish had the wow factor with the flambé being lit in front of us and gave the most amazing aroma of cinnamon. It really was brilliant to watch. C however thought the dish did look better than it tasted and was almost let down by this dish. Each dessert is made with love, care and attention and is literally a piece of art. They are simply amazing to look at and a treat to the palate. There are interesting combinations of flavours, textures to create a truly memorable experience. Om Nom doesn’t only do dessert – they do have quite a great sounding savoury menu as well – albeit the main focus being on dessert. There are dishes like caramelised foie gras with goat’s curd and fig, a summer pear salad, wagyu slides to pan seared duck breast just to name a few. S and E ordered some of the savoury dishes. First up was the Caramlised Scallops, Asparagus, Light Curried Coconut Broth & Lemongrass Oil – the scallops were seared perfectly and as a result had the right texture and softness to it. The thai flavours paired with the asparagus was a winner as well with the flavouring complementing the scallops. Next up was the Pan Seared Duck Breast, Duck Confit, Apple Cider Jelly, Galangal Honey Suace, Celeriac Puree and Celery Coulis. E loved the way the duck was cooked – literally melting in her mouth. There were many interesting components and flavours in this dish as well that the palate got to experience. The Celery Coulis was really interesting – very fresh and invigorating. Lastly C ordered the Wagyu Sliders with Caramelized Onion, Cornichons, Perigreux Sauce and Shoe String Fries – you get two sliders which were flavoured well and came with a side salad. Om Nom also does High Tea on Sundays from 12pm till 4pm. The cost is $65 per person and there is a minimum of 2 guests required. You get a selection of savoury and sweet dishes that include vol au vents with asparagus and mushroom, vegetable tempura, two different gateux’s and the pineapple verrine. This comes with tea/coffee as well as a macaron. Just check their website for an updated menu. 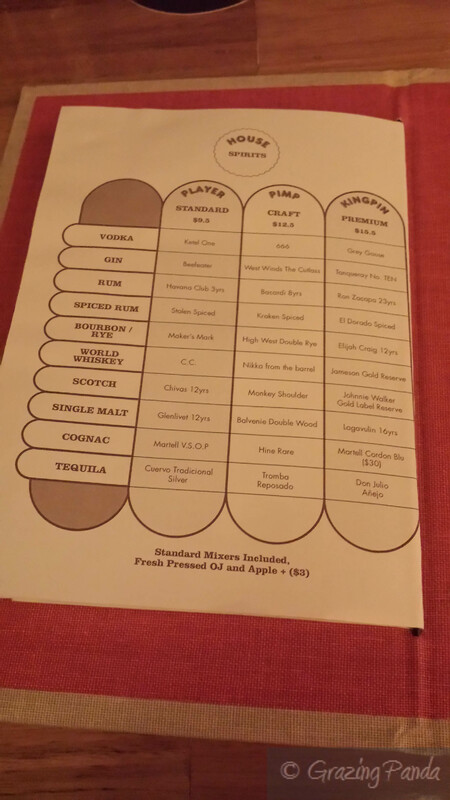 The drink menu is quite extensive and there is a section called “Liquid Desserts” as well that have some great sounding drinks such as Cookies and Cream to Cherry Ripe. Their list of cocktails is also impressive and one labelled Earl’s Punch comes with a macaron – fancy! There are also the usual drinks of wine, beers and spirits as well as tea and coffee. The tea serving is quite generous – a whole pot which was enough for three of us to have two cups each! Om Nom is a must try for everyone that loves desserts –it definitely has the “ooh and aah” factors involved in terms of presentation and taste. I can’t wait to see any new additions that will be added to the menu. The place is classy, elegant all the while staying comfortable and relaxed. The staff are friendly, knowledgeable and very helpful.When leaving you can grab a little take away lolly bag filled with mints if you wish as well! Atmosphere / Ambience: Classy, Elegant and has a WOW factor. You almost feel like you are transported to another land for your time spent here. Service: Knowledgeable and Helpful. If there is a special occasion and you let them know – they can customise your dessert! 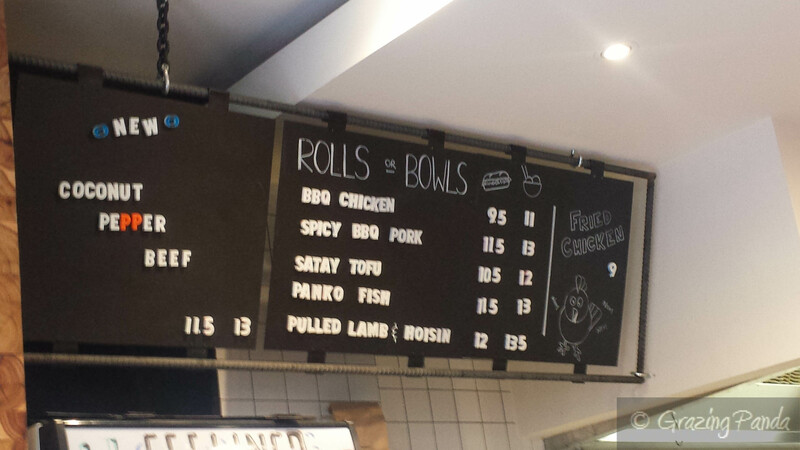 Supernormal Canteen – Another McConnell Gem! T and I were heading out to dinner and decided to check out Andrew McConnell’s latest venture and temporary pop-up in Gertrude Street, Fitzroy. The name of his new place, which is located right next door to Cutler and Co. is called Supernormal Canteen – which is due to open in March next year at its permanent location in Flinders Lane in the heart of the Melbourne CBD. As you walk in you are greeted with an open space filled with wooden communal and individual tables with Japanese characters saying “Suupaanoormaaru” (Supernormal) all along the table top. To the left is a white washed brick wall with its name – half in neon red lights. The centrepiece is the hundreds of lanterns complete with googly eyes that line the ceiling. Spectacular. The design gurus Projects of Imagination are to thank for the design here. 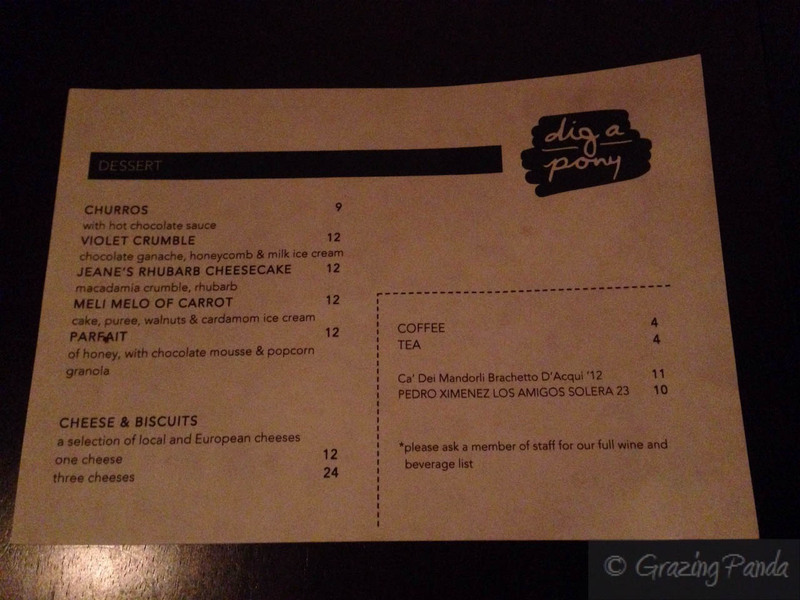 The whole vibe of the place is relaxed and fun and has a food and drink menu to match. There are two main dining areas, as well as some seating out the front. Supernormal Canteen was launched in November as part of The Age Good Food Month and was only meant to be open until December 21st, but due to its overwhelming popularity was extended till the beginning of March. Supernormal Canteen serves Japanese/Chinese food together with sake and Asahi beer, and gets packed by about 6:30pm – where you would then expect a wait for a table. The menu consists of about 18 dishes to share which vary in size, as well as 4 different desserts. The dishes range from Wood Grilled Cabbage, Pepper Cured Blackmore Brisket, the famous Lobster Roll, Chicken & Prawn Dumplings and Szechuan Lamb just to name a few. T & I decided to order some dishes to share. For drinks I ordered the Iced Coffee – which comes with a little aluminium cup with extra sugar syrup for you to add when you feel like it. The coffee was strong but delicious and I loved the addition of the extra sugar syrup for later. We were also given some roasted peanuts (in place of where most restaurants would give out bread) to nibble on whilst we waited for our dishes to arrive. They were deliciously flavoured – and you had to stop yourself from eating the whole bowl in one go. The first dish we got was the Bonito Sashimi, Dashi, Radish & Seaweed. The dish comes with the Kingfish at the bottom of the plate with the radish on the next layer and finished with the seaweed on top. The Kingfish was fresh, thick and just perfect, paired with the dashi and the crunch of the radish and seaweed it really was quite delicious. A really great combination. Our next sharing dish was the Fried Mussels, Egg Mayo, Lettuce. The sauce was interesting as on the bottom there was chilli and the egg mayo was placed on top – so when you dunked in the mussels you got a combination of both the sauces – really great! The Fried Mussels itself were delicious and the first time that I was eating mussels this way! The mussels were crisp on the outside and just still moist and juicy on the inside. The way you were meant to eat it was to wrap the mussels in the lettuce and dip it into the sauce. Any which way you eat it – this dish is just fantastic and I would highly recommend it. Next up I ordered a Lobster Roll – I mean how could you not order one especially if you have tried one before (I had my last one at Golden Fields). The bun was sweet as was he lobster and combined with the tang of the mayo was just delicious. It definitely kept me wanting more. I would have loved a bit more lobster in my roll though. We went with some of the larger dishes as well with T ordering Grilled Ox Tongue, Tomato, Yuzu & Potato for her and we also ordered the Steamed Snapper, Ginger, Coriander. T said the Ox tongue was cooked well and she did enjoy the flavours. The Steamed Snapper dish came out with the snapper being buried under the coriander and radish – you had to push that all aside to reveal the snapper. The snapper was perfectly cooked – not too soft, not too tough – and the flavours of ginger, spring onion together with the fresh coriander was quite good. It smelt great and tasted Just as it smelt – it was also a very generous serving. Even though I was quite full I had to have dessert – and lucky I didn’t skip it as it turned out to be the yummiest and one of my most favourite desserts ever. I ordered the Yoghurt Cream, Lychee & White Chocolate. When it comes out it looks like berries and lychees have been buried in a powdery snow like substance – and it really doesn’t look like much. Just wait till you dig into the dish. The powder was an awesome texture and as you dig further you get the hit of the white chocolate. Combined with the freshness and tang of the berries and the “yoghurt”, sweetness of the lychees and the white chocolate – the result is absolutely divine! I really do hope they keep this dessert on the menu when they move to Flinders Lane. 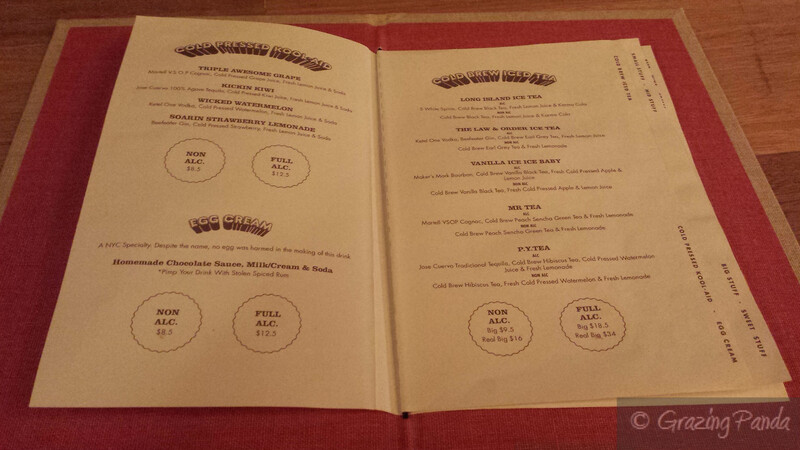 I really enjoyed the vibe and the atmosphere at Supernormal Canteen. They serve really delicious, casual Asian inspired dishes and have a great drinks menu to go with it. The staff are super friendly and very knowledgeable about the food. There are rumours that when the new permanent venue opens up it will also house a karaoke bar – for extra added fun! I for one cannot wait to see the permanent venture opened. Mercy Bar + Eatery is located at the top end of Flinders Lane (near Spring Street) where the old Virginia Plain used to be. Marco Santucci is still the owner, Andy Hammer is still the chef and Mat Beyer is still front-of house – but what has changed is the interior and the menu. Artist Steve Cross has redecorated the interior with graffiti art and it’s funky to say the least! The artwork is colourful, bright, intriguing and can be talked about for quite some time. There are pictures of contorted faces and objects with varying shapes and colours. The venue is fit out with wooden tables and chairs in the dining area of the restaurant, with the front section having communal tables and high tables for drinks and gatherings. The lighting is quite dim, with not many light shades fitted out through the venue, although it creates a great ambience. Near the table we are at there is one light to the left of us, together with artwork of a woman’s face in green and pink tones (have a look at the picture above). The kitchen is open plan and located in the back of the dining area so you can see the chefs preparing your meals. I got there a tad bit earlier than G so ordered a mocktail – they asked what kind of flavours I wanted and would make one to match that. The result was a fruity, orangey and lime concoction which was quite refreshing. Once G arrived we decided on what food we would want. 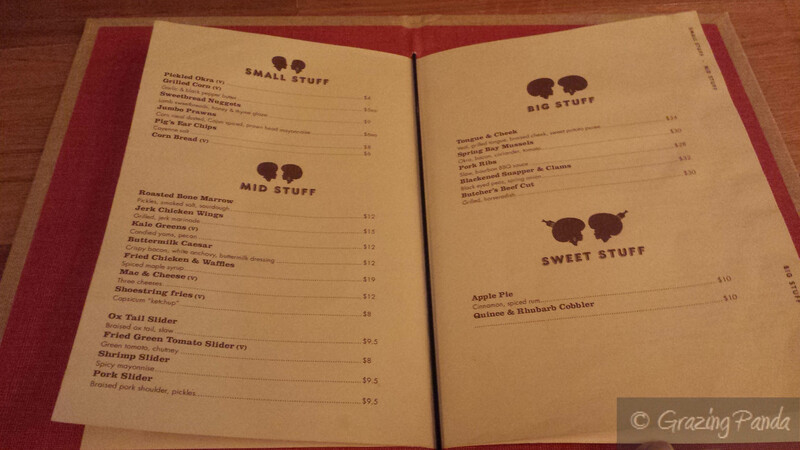 The menu is new and has an emphasis on bar snacks with 12 to choose from. There is a variety of entrees – there are about 7 to choose from which include eel, quail, wagyu and kingfish – together with a selection of 4 different salads. Mains are also available ( you can choose from 5) and these include Fish, Beef Cheek, Wagyu and Pork Belly and finished with Desserts – there are also 5 to choose from. The waitress informs us that there are also specials available – one from the entrée section and one from the main section. To start with we decided to get the Eel & Roasted Beetroot Salad with Horse Radish Cream and the Hand Cut Chips to share. I love that there was Eel on the menu – there aren’t many places that serve eel so I was definitely keen to try this dish. The dish was presented beautifully and was such a colorful dish against a black dish. The horse radish cream served as a base, where pieces of eel, beetroot, swirls of onion and crisps were daintily placed around. The eel was seasoned perfectly and was cooked just as well. They were bite sized pieces of eel and together with the horse radish cream and sweetness of the beetroot was a delicious dish. The Hand Cut Chips were also just as amazing. They chips were all different shapes and had some bits of potato skin left but this is what made them so good – they were authentic and fantastic. The potato was fresh and the chips seasoned with a perfect amount of salt. Next up was the mains – G ordered one of the specials on offer and got the Lamb Special Sauteed served with Beetroot, Carrot and Potato Mash and I ordered the Hapuka Fillet, Du Puy Lentils, Caramelised Endive. Once again presentation of both these dishes was great. My dish came with the Du Puy Lentils and the two pieces of Hapuka Fillet placed on top with the endive and salad leaves around it. There was also a smearing of mash. The Du Puy Lentils was my favourite component of this dish – the sauce in which it was cooked in was really delicious. It had a sweet and nutty taste to it and really brought the whole dish together. Couple with the perfectly cooked fish – the skin was crackled and crunchy – and the mash it really was a great fish dish. I am not an endive fan so didn’t eat too much of this component. G enjoyed her dish as well, however she said that the Lamb had too many fatty bits to it and she found her mash a tad bit too salty. We were both really quite full from the meals but decided to share a dessert dish – we went with the Hot baby Madeleines with Selection of Custards. The Custards that came out was a lime custard. The Madeleines were warm and crunchy on the outside, soft and fluffy on the inside with the sweetness just right. The Madeleines came in the same bag style that the bread was served and it felt like they were never-ending – which was really great because you could just keep eating them. The custards were great as well, and added some tang to go with the sweetness. It really was a great way to bring together a pretty good meal. Mercy Bar + Eatery is a great place to come for a dinner or even a quick snack and drinks – a place for casual, relaxed dining. On this Friday night by the time it got to 7pm the place was buzzing with people mostly around the bar area having drinks. The dining area too was quite filled up. The team behind this new venture have stepped it up from Virginia Plain days and it really is a great transition. I definitely want to come back and try things from the Bar Snacks menu. NOTE: Mercy Bar + Eatery will still take bookings for its dining section down the back, and anyone who was a previous customer at Virginia Plain will always be able to book – a thank you for being there from the start.